Laminate, solid surface, stone and wood products can remain durable and attractive for many years with proper care and maintenance. This sheet offers simple solutions for keeping these surfaces looking and functioning at their best. 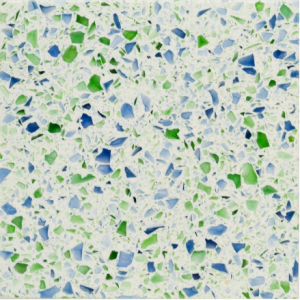 High pressure laminate (HPL) is a durable, attractive cabinet and countertop finish material made of resin-impregnated cellulose layers bonded by heat and pressure. With proper care and maintenance, laminate surfaces can remain functional and attractive for many years. Heat. Exposure to hot items, such as a pot from a hot stove or cigarette, can burn the laminate. Don’t set hot objects directly on the laminate. Avoid temperatures in excess of 140℉. Stains. Laminate can be stained by coffee, high acid foods (like citrus), and many inks . For difficult stains use denatured alcohol or acetone (nail polish remover). Abrasive pads, brushes, or harsh chemicals may scratch or dull the surface, particularly on laminates with a gloss finish. Do not use oven cleaner, drain cleaner, toilet cleaner, or other chemicals not intended for countertop use. Scratches. Laminate can be scratched, cut, or gouged. Use cutting mats or boards to reduce the chance that sharp objects damage the surface. Laminate touch-up kits can be effective by using a waxy putty that can be mixed to match color and a clear finish. Water. Water can penetrate laminate at the seams and cause the substrate to swell. Solid surface countertops, often called “Corian” after the brand name, is an “…acrylic polymer and alumina trihydrate (ATH), a material derived from bauxite ore.”1 It’s durable, attractive, versatile and cost effective when compared to natural or engineered stone. It also tends to be warmer to the touch. 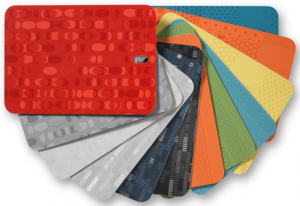 Popular brand names include Corian, Avonite, Staron, Formica, and Livingstone. Heat. Hot pans, appliances, cigarettes, or other items that reach 400oF can burn the surface. Deep burns will likely require replacement. Lighter surface scorch marks may be removed by using Scotch Brite® abrasive pads or a fine grit (220 or higher) sandpaper. Stains. Solid surface is generally resistant to stains but acid or alkaline chemicals such as oven cleaner, drain cleaner, toilet cleaner, or rust remover can discolor the surface. To remove stains, use a Scotch Brite® abrasive sponge or Comet® to gently remove the stain. For deep stains a fine grit (220 or higher) can be effective, though gloss finishes can lose their shine when sanded. Scratches. Light scratches can be removed using Scotch Brite® abrasive sponge, or by rubbing a mild abrasive, such as Comet®, on the scratch. To restore a semi-gloss finish, sand with 400-grit sandpaper in a circular motion followed, followed by a 600-grit sandpaper. Products such as Solid Surface Shine can help restore gloss after scrubbing or sanding. Water. Solid surface materials are impervious to water, of course, but water can leave an unsightly film on the surface if it puddles and sits for long periods of time. Most cleaners can remove these blotches but it’s best to dry the countertop and avoid the problem altogether. Cleaning. Normal kitchen cleaning products such as Fantastik® All Purpose Cleaner, Formula 409®, Pine-Sol®, and similar ammonia-based cleaners work well on solid surface. Products like Rejuvinate®, Pledge Multi-surface®, and Hope’s Countertop Polish® can help restore original gloss. 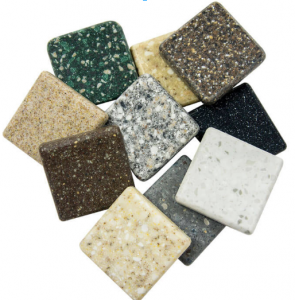 Engineered stone typically combines crushed marble or quartz bonded under very high pressure with a polymer resin. Because it is very hard it tends to be more resistant to stains and scratches than other countertop materials. Engineered stone is the easiest countertop material to care for simply because it is so incredibly hard. That said, it can be broken, scratched, or stained. Here are a few tips for keeping engineered stone looking like new. Heat. While engineered stone is heat resistant, all manufacturers warn against rapid heat changes, particularly near the edge of the stone. Instead of putting hot pots or other objects directly on the stone, invest in trivets or hot pads. Stains. Strong chemicals and solvents can stain or damage the finish of an engineered stone top. Regular food items such as coffee, lemons, oil, tea, etc., are generally not a factor as they can be with natural stone. If harsh chemicals come in contact with an engineered stone surface, dilute and clean with water immediately. Scratches. Engineered stone is scratch resistant. However, the high-gloss finish can be scratched under certain circumstances. To avoid this, always use cutting boards and trivets. When scratches do occur, us a high-grit sandpaper such as 3M® 400-Grit Wet or Dry sandpaper, followed by a polishing product like Chase Champion® stone polish. Water. Water will not damage engineered stone. However, if water pools and dries it can leave a dull blemish. Clean the blemish with a standard cleaner (see below). Cleaning. A damp cloth and light detergent such as Fantastik® All Purpose Cleaner, Formula 409®, Pine-Sol®, or similar ammonia-based cleaner is generally all that is required to clean engineered stone. If a stronger cleaner is needed, consider a non-abrasive soap like Soft Scrub Liquid Gel with Bleach®. Never use oil soaps, oven cleaners, paint removers, toilet cleaners, tarnish removers, furniture cleaners or other very high/low PH cleaners. The beauty of stone derives from its natural patterns, colors, and hard yet smooth surface. However, stone can be scratched, stained or broken. For detail on this subject, visit the Marble Institute. 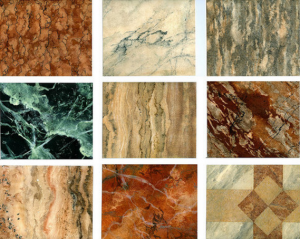 Below are solutions for maintaining the beauty of natural stone.